“You haven’t written the report yet. That’s because we lost, isn’t it?” The tone is mildly accusatory, but the Rocker we’ve just bumped into, two weeks after the Milk Rollers game, is smiling as she says it. We point out that we’ve swiftly written up far bigger defeats than this in the past – the two trips to Sco****d (you can’t say the full word in front of a Rocker, they start hyperventilating) being a case in point. “Yeah, but that wasn’t at home. We never lose at home. Until now.” She’s got a point, and we are indeed very late getting this report up, but the result isn’t to blame. General spring sluggishness is one reason, but another is that we’ve been busy finishing off a big feature for the next issue of national derby magazine Lead Jammer. The subject of that piece is gambling, and the Brighton v Middlesbrough game plays an important role in the article. It was, you might be surprised to learn, the first roller derby game that a UK betting firm was taking bets on. Bookies rarely get it wrong, and the prices they were offering demonstrated how much of a task Brighton had ahead of them on May 10th. The hosts had been priced at 2-1 to take the win, whereas Boro were an odds on 2-5. The Teessiders are, after all, the highest placed English team in the UKRDA table, and the toughest domestic opponents available to the Rockers. (Brighton having already faced two of the three teams that sit above MMR in that table, and been declined a match by the other.) The word from the Sussex locker room as the game approached was that “blocking wise, we think we’re fairly evenly matched” but “their jammers are supposed to be out-of-this-world”. This analysis will prove pretty accurate. What surprises us is how few in number the Boro rotation is – just three skaters dedicated to jamming, compared to the broader pool of six or seven double/triple threats we’re used to from Brighton. Two of MMR’s starheads – Terri Sudron and Ella Storey – were part of the England national side that recently defeated World #2 Canada, and together with Lolly Go-Sprightly they swiftly set about carving out openings, ducking and juking, sweeping and swooping, in and around the Brighton walls. The MMR packs are proving equally clinical, keeping the Rockers jammers pegged back as the Teessiders take lead after lead. Six jams in, with the score standing at 0-45, one wonders if William Hill have actually been generous with those short odds on a Northern win. The seventh sees Rose Bleed on a power jam, but Little Grr-Maid holds her up well as the last line of defence. The Mighty Mighty Bash battles to contain the returning Boro jammer, but picks up one of the first penalties of the game. Still, points on the board now. 13-45. Shambolic takes lead in the next, but those in the MMR star are so blisteringly fast that taking lead is absolutely no guarantee of taking points, and Lolly wins this one 3-0 with a whistle-accompanied swoop through the Brighton pack as Sham falls and calls. The next jam sees Cake or Death hobble off track for treatment from the EMTs. A further blow for a Rockers squad that went into this game without their star performer from the last outing; Chariot Sophia, whose penultimate jam destruction of Paris had turned that game around. She’s here, but only as a spectator, having just returned from an expedition to South America. Tough blocker Chaka Carnage is also bleacher-bound today. Ultrafoxx has taken Sophia’s place in the jamming roster, and is making her debut in the Sussex star today, having only blocked against Paris. It’s quite a step up from the level of opponent she faced with previous club Vendetta Vixens, but her hard charging style will see her break through the MMR pack where lither jammers have struggled, and she’ll chalk up a few points here and there. 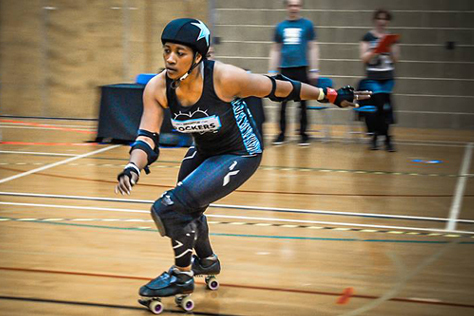 Another fairly recent addition to the jammer rotation, Dr Whooligan, will put in some of Brighton’s best starclad performances, but winning jams are few and far between for the Sussex squadron. Mistress Von Über Vixen hangs from the wall by turn one, disguised as a glitter ball, where she relays and supplements instructions from the bench. The Rockers are getting more purchase as the first period draws to a close, but tough cyan shirted blockers like Grr-Maid, Moose and Gunpowder Dot are making them fight hard for every point. Half time score: 50-104. The home fans are less worried than they might be. Brighton used to have a habit of second half lulls at home, but the last of those was against Leeds in September, when only a fifty point cushion from the start of the game helped keep the Rockers’ noses slightly in front at the end. The last three home bouts, culminating in that epic final five minutes against Paris, have seen Brighton come out stronger in the second period. Today’s scoring statistics are actually fairly encouraging in terms of showing how much better the Rockers have fared as the first period progressed. Dividing the half into three sections of roughly 10 minutes each, then working out the average points scored per jam, makes this fairly clear: BRRD 1.6 MMR 6.0, BRRD 2.1 MMR 4.1, BRRD 2.0 MMR 2.1. In other words, Brighton started out scoring a quarter of what Boro were getting, closed that to half in the midpoint, and then had pretty much reached parity by the final third of the period. Whilst the Sussex league’s jamming hauls have increased slightly, what these figures demonstrate far more is how much more of a handle Brighton’s defence was getting on those tricksy MMR starheads as the game progressed. If the Rockers can keep the Milk Rollers’ jammers to their current two points per jam average, whilst edging up their own scoring in the second period, then anything’s possible. The second part of that equation comes to fruition in the first third of the final period, with Brighton doubling their points per jam average to 3.9. Unfortunately for the Rockers, MMR crank their own scoring average up too – to 4.6 – and continue to nudge up the overall scoreline differential. Bang go any half time hopes that Boro’s short jammer rotation would mean them tiring as the game progressed. Bash is starting to feature in the Rockers star more now, and her shoulder charging runs and outside passing swoops are picking up points. Cue texts from several friends in the crowd asking “why doesn’t Bash jam more often?” The fact that MMR’s own points hauls have picked up so much might answer that question. Whilst there are many tough hitters in the Sussex pack – Derby McGee, Whooligan, Hairy Fairy, to name just three – nothing scares an opposing jammer quite like having that number 888 in front of (or, worse, alongside) them. The star’s gain is the walls’ loss. The final jam of our arbitrarily divided third of a period sees Ultrafoxx seemingly take lead, but Ella Storey – the prickliest of all the thorns in Brighton’s side today – produces a breathtaking apex jump from the back of the pack to take first pass. There’s no stopping the Teesside jammers at the moment. 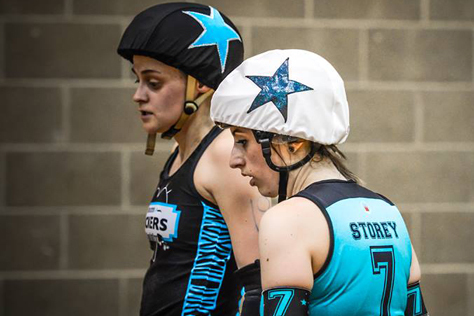 “What happened to make the Milk Rollers so good?” is a question many in the UK derby community have been asking, having watched a league with a history of losing charge their way up the rankings in the past couple of years. Some Robert Johnson-esque pact with the Devil is the most logical explanation, of course, but another might be that 2011 happened. That year when MMR decided to close its doors to opponents and concentrate on their own tactics and training; looking at what the top leagues were doing, adopting any elements that suited Boro’s own style and personnel, and adapting (or replacing with something better) any that didn’t. From that MMR evolved, over time, elements like the current dedicated trio of jammers, something of a rarity in a sport where most leagues still go by the “give everyone the chance of trying everything” credo. It certainly works for Middlesbrough. The home crowd are now cheering every time a Rocker passes the pack first, then silently sighing when they realise they are passing in the ref lane, having been sent off for an infringement whilst trying to break through. 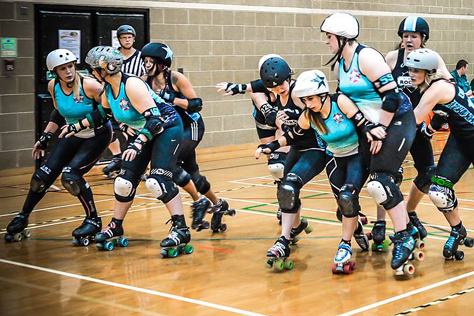 “Stay on their jammer,” shouts Brighton captain Racey, her voice probably audible not just here in Haywards Heath, but also in the Dolphin’s sister leisure centre in Burgess Hill. (Some squirrels may have fallen out of trees in Ashdown Forest as a result also.) Back on track, Sudron, Storey and Go-Sprightly are proving as uncontainable as ever. Brighton are back to 2.1 average jam scores, whilst MMR are now posting a game best of 6.2. Sham is proving Brighton’s biggest jamming threat at present, and the crowd are getting behind her with a “Sham-bo-lic” refrain, but even a power jam (with Lolly sin-binned) is hard going. The Teesside backs in Teesside packs are proving rockfall tough to pass, and Brighton’s jammers look like they’ve run a marathon on every pass now. 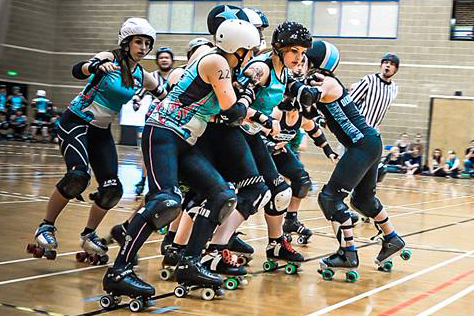 Even when the Rockers get a starhead out first, the opposing jammer is usually past them and forcing the call before they’re even halfway round the track. Now Bash is seemingly off, presenting MMR with another power jam, but Head Ref LaserHammer overrules the call and she rejoins the track. It’s been a reasonably clean game from both sides, really, with full penalty boxes very much a rarity – although perhaps this is an ‘optical illusion’ caused by the move to 30 second rather than 60 second penalties. They’re not sat there long enough for us to notice them! With the scores at 105-196 and less than eight minutes left, keeping the gap to less than a hundred is about the only cause Brighton have left to fight for. Sham takes lead, but is up against another super solid MMR three-wall. Brighton return the favour a couple of jams later, with a very solid Rockers wall of Hyde ‘N’ Shriek, Racey and Sham keeping Storey pegged back as Rose drags the differential down from 100 to 90, and the crowd go slightly wild. “I don’t like the Middlesbrough bench manager because he wears a tie,” someone behind us says. Some jammer-on-jammer action between Sham and Sudron follows, then an MMR power jam that sees the hundred point gap breached again. Final score: 123-230. The crowd spills onto the trackside as Brighton take what will be their first ever non-victory laps and slaps at home. The final sixth of the game saw average points hauls of 3.0 against 4.1. Overall points tallies were 50-104 in the first half (1.9 v 4.0 per jam) and 73-126 (2.9 v 5.0) in the second. Whilst Brighton managed to average an extra point per jam in the latter half, so too did MMR. That’s if we’ve actually done our maths right, which is pretty unlikely, so please treat all these averages as drunken guesses. Either way, it was a valiant, battling performance from the Rockers All Stars, but the Milk Rollers jammers were just too fast, and their blockers were just that little bit too tough to pass – these are amongst the many reasons why the Teessiders rank #1 in England in the (LRG-free) UKRDA table, of course. Where next for Brighton? Having taken on most of the teams a rung above or alongside them domestically, rematches are an option, but a handful of interesting first meeting possibilities still remain, such as Nottingham’s Hellfire Harlots, Hot Wheels (Halifax), Newcastle or Royal Windsor. There are some up-and-coming nearby leagues that might provide a good workout at some point too, such as Portsmouth and Croydon, both of whom Brighton know well but have yet to face on track (excluding on a B-team or closed door basis). Getting revenge on Bristol for *that* tournament defeat last year is another gnawing option. There are probably as many possibilities beyond these shores. If we were to guess at potential Euro opponents, the likes of Copenhagen, Stuttgart, Bear City (Berlin), Stockholm, Crime City (Malmö) and Helsinki/Kallio would be on our list. Whoever they might play, having lost that undefeated home record millstone from round their necks, the mighty Rockers face a varied and exciting future for the remainder of 2014 and beyond. Having been accused in their early years (while still finding their wheel-clad feet) of picking easy opponents, Brighton have in the past year faced probably the six toughest UK opponents available to them, and won half of those contests. Revenge matches for the defeats may follow, and having already despatched the strongest leagues that several other European nations (Ireland, Belgium, France) have to offer, there are new continental lands to conquer too. Roller derby is forever changing, forever evolving. The people who play it are increasingly striving to be recognised as the athletes they are – roughly 90% of the most recent Team England squad skated under their real (rather than WWE-esque ‘derby’) names, and the Rockers themselves seem to have dropped the theme and fancy dress elements from recent games. Spectators are being asked to recognise the sport as such, where some in the past may have been inclined to view derby within a pro wrestling or performance frame of reference. So you want to see this sport at its best possible level, right? Where would that be if you live in the South? They say you should draw a line from The Wash at top of East Anglia to the Severn at Bristol/Newport, and everything below that is officially ‘The South’. So buy a map, draw that line, and compare it to the current official UKRDA rankings table. 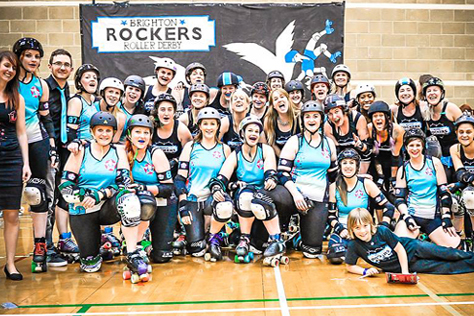 Which is the highest ranked roller derby team in that entire Southern England area, a region encompassing London, Norwich, Bristol, the Home Counties, Cornwall etc and housing more than 25 million people? 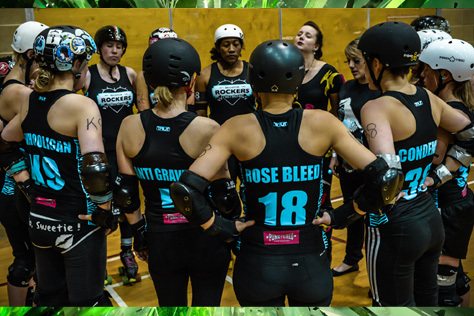 That league – Southern England’s highest ranked roller derby team – are called the Brighton Rockers, and they return to action here in Haywards Heath on Saturday 26th July, with opponents TBA. Book whatever days off, holidays, babysitters or day releases you need to right now, because it (and they) WILL be amazing. Just don’t let any of the players know we won two quid by betting on Middlesbrough, yeah? If you missed the recent home game against Middlesbrough Milk Rollers, there are a handful of physical copies of our fanzine available in the Evening Star, Cornerstone and Punktured. Or you can click on the cover above to go to the online version. Huge thanks as ever to all the interviewees, photographers and lovely advertisers. Cheerses. 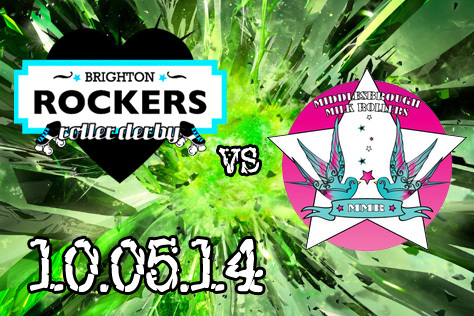 The Brighton Rockers complete a series of three home games in fairly quick succession when they face off against Middlesbrough Milk Rollers on Saturday 10th May. The match starts at 3pm at Brighton’s usual home venue, Haywards Heath’s Dolphin leisure centre. The venue is five minutes walk from the train station, and features seating, vendor stalls and two bars. Tickets for the game, which is part of Brighton Fringe (the world’s third largest fringe festival), are on sale online at £8 each or £24 for four (£6 each). Tickets for under 12s are free. See the link at the bottom of this piece. To say this a big game – the word ’bout’ was recently dropped by world governing body WFTDA, incidentally – would be something of an understatement. 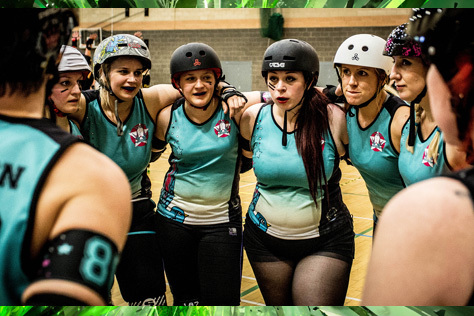 The Middlesbrough team currently rank fourth in the UK, and with the teams above them hailing from North and West of the border, they’re the highest placed English league (in the absence of all-conquering London Rollergirls, who are too USA-focused to qualify for the UKRDA rankings). Two of the Milk Rollers were amongst the most recent Team England fourteen, which took part in a tournament in France and saw England defeat not just the host nation, but also number two in the world Canada. Terri Sudron and Ella Storey represented the national side, and their international exploits highlights the current strength of the Teesside league. Middlesbrough famously took a whole year off playing games in 2011 to focus entirely on training, and the plan seems to have done the job, with MMR having charged up the rankings since they resumed competitive play. On paper this is the biggest challenge the Rockers will have faced at home, and it will take an awesome performance if the Sussex side are to maintain their historic unbeaten home open door record. Having said that, Brighton have beaten the second, third and fourth ranked English UKRDA sides at Haywards Heath in recent months, so taking on the top ranked league next seems a natural decision. The official UKRDA table at flattrackstats.com places Middlesbrough fourth on 676.5 points, with the Rockers tenth on 644.5. The site’s online predictor gives the North East team a 69% chance of taking the win. Brighton have been remarkable consistent in terms of points scored at the Dolphin recently, coming within a couple of points of 175 in all of their last four home games. The Milk Rollers, meanwhile, tend to average a little over 200 away from home. This would seem to tie in with flattrackstats’ predicted 17-21 score differential (the equivalent of a 170-210 away win). As ever, though, if it was really possible to accurately predict sporting results, bookmakers would be homeless, so let’s see how it plays out on the day.